Last year RubyFoo toured in Copenhagen and Oslo and this year it's going to hit the big city of London. The concept is simple - two days worth of thought provoking conference with a driving theme. This year our theme will be Communicative Programming where we will ask questions such as "when, why and how can I make Ruby talk my language?". The conference covers two days, one for presentations from leading experts within the Ruby community and another for collaborative hacking giving you a chance to hang out with Ruby geeks, experts, and curious newcomers in a casual and laid back atmosphere. So come, listen, learn, contribute and share the RubyFoo. Yukihiro "Matz" Matsumoto,The chief designer of the Ruby programming language. Ola Bini, recently published the book 'Practical JRuby on Rails at APress'. Sam Aaron, Innovation Factory, NL. 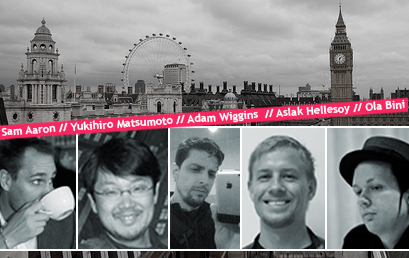 Saturday is a casual get-together between you, the speakers, and fellow rubyists. Here you can go to short ruby talks about exiting new stuff, or you can participate in collaborative hacking in an open space environment. Bring your own project and present it to the crowd or be the crowd and hack along. If you have a suggestion for a hacking slot, please send your proposal to rubyfoo@trifork.com and we will post it on the website.